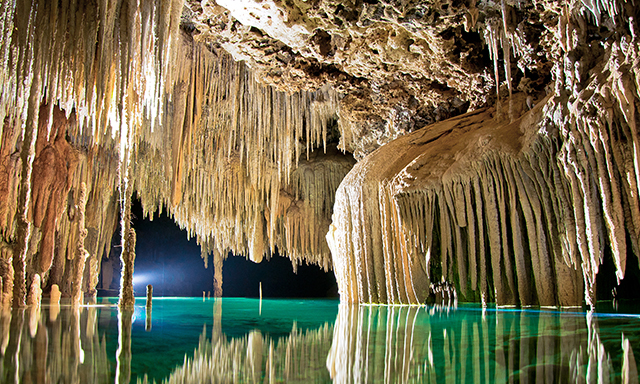 Come and witness the region's most unique natural treasure – an amazing series of caverns connected by underground waterways and awarded as “Mexico and Central America’s Leading Nature Reserve”! Picture yourself admiring this breathtaking crystal museum carved by Mother Nature over millions of years. Walk, wade, and swim through a 600m route past stalactites, stalagmites, and other formations enjoying its crystal clear fresh water . Following an expertly guided tour of this mesmerizing subterranean world, included in the “NAT GEO Top 10 Family Activities” and EarthCheck Silver certified for its good sustainable practices, you’ll taste the local flavors with a delicious buffet lunch, and visit the shops of Playa del Carmen’s famous 5th Avenue. • Cavern Excursion: Swim and wade through underground waterways, and stroll through an amazing subterranean world. • Buffet: Enjoy a lunch of soup, chicken, rice, beans, handmade tortillas, salads, fresh fruit, and water. • This tour operates under all weather conditions. • Uneven ground inside the system. • The ferry to and from Playa del Carmen is included. • Guests can purchase photo packages for an additional charge of $99. • Watches, jewelry, photo or video cameras are not allowed inside the underground river. • For safety reasons guests with mobility issues, pregnant women, guests with heart or respiratory conditions and those with back/neck injuries and/or recent surgeries are not allowed to participate. • Guests with cardiac conditions, asthma, diabetes, epilepsy, pre-existing neck, back, knee or shoulder injuries, other heart or respiratory conditions or any other medical condition must take particular caution when selecting a tour with snorkeling/swimming elements, since such water activities could be subject to adverse sea conditions such as high winds, waves and sea current.